From land to sea … It’s time to wrap up our Texas-based Muck adventure, but not before we go fishing and gigging. In an earlier account, I regaled you with stories of our hunting for alligators, teal and hogs. Now, it’s time for the surf portion of this story, where Hollis Lumpkin and Melissa Board join me on another action-packed journey outdoors. I’m a busy mom with a fulltime career and little downtime so sometimes I forget to relax … actually, I forget how to relax. Period. Something about the coast calms me. The smell of the saltwater, the sound of waves crashing on the beach, the sun shining on my skin and fishing, which I’ve decided is good for my mind. Not to mention, all the beauty you experience when you sit back, relax and enjoy nature. 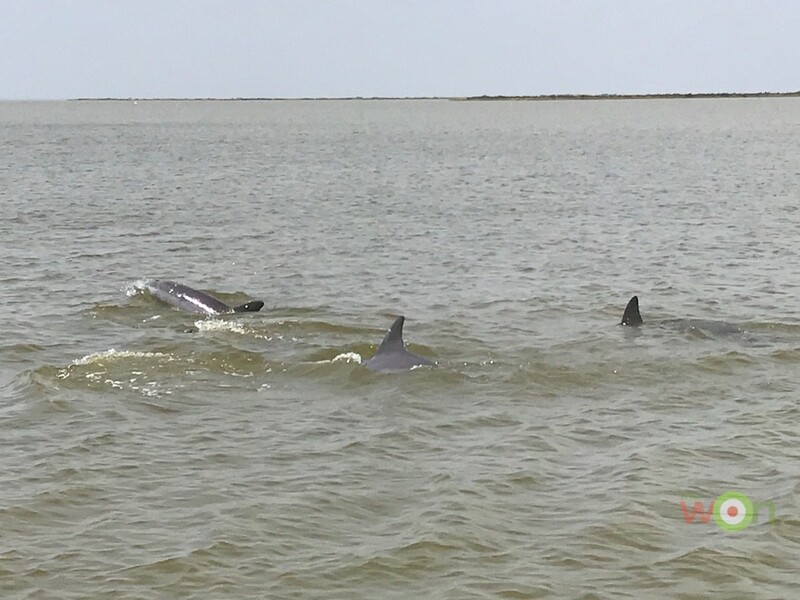 The dolphins put a show on for us – all playful, yet graceful. 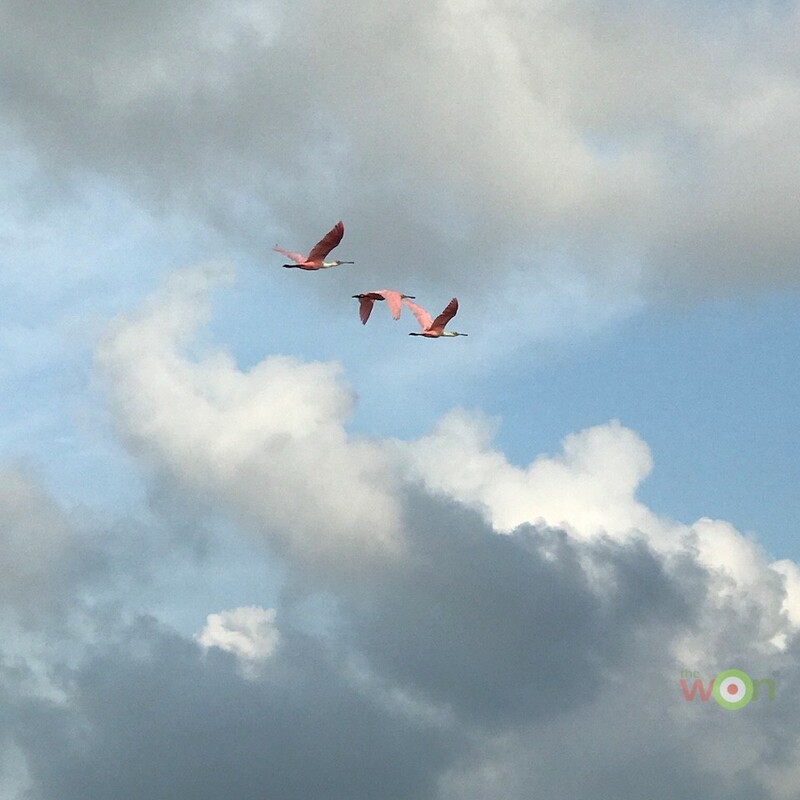 Roseate spoonbills flew around us, showing off their pink color (which comes from their diets) and their acrobatic moves. Jessica fishing and keeping an eye out for hogs. Our airboat is parked and guns out, just in case the hogs decide to make an appearance on the island. It is time to bait the hooks, kick back and enjoy the sunshine. A hit on the line here and there, but nothing yet – who cares? We are on the water! I thought I had a bite, so I attempted to set the hook. I quickly found out that it wasn’t a bite, but a cluster of oyster shells. 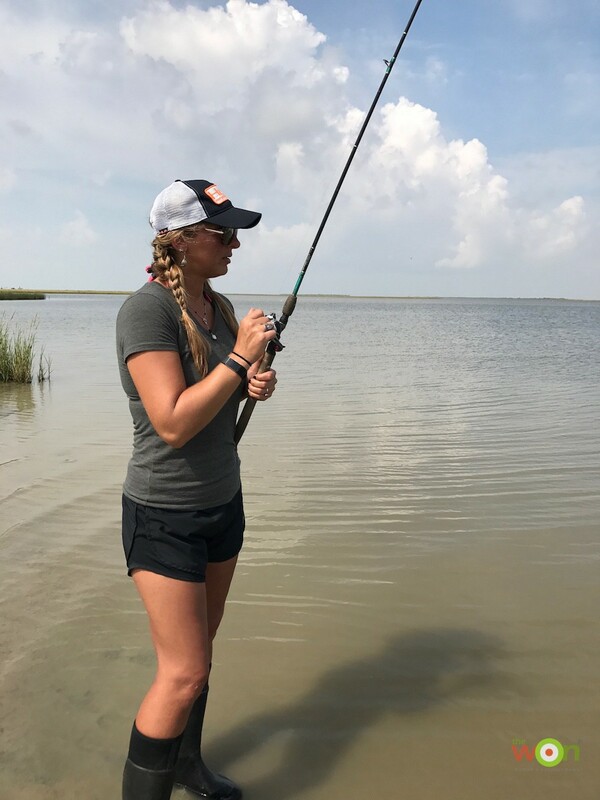 Suddenly, Melissa started bringing her line in – only to find a fish that wasn’t much bigger than the bait we were using. Not much time had passed before Hollis started reeling in fish bigger than bait. 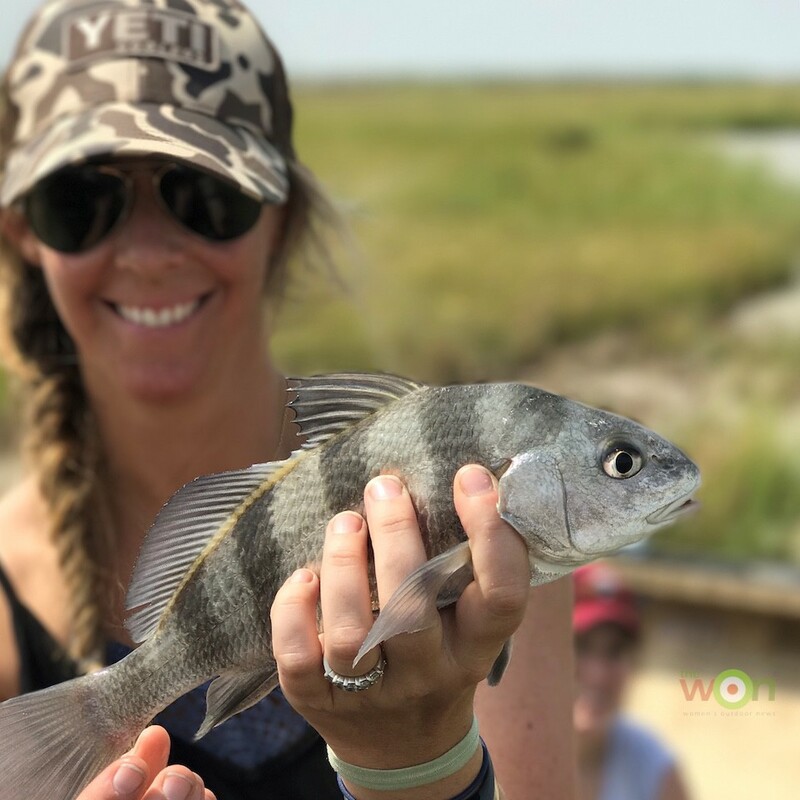 We had no luck on the Redfish, but a brim did bring some excitement – again, who cares … we are on the water and having a great time. Time to sleep Mr. Crab. Finished with fishing, we head back to the lodge, but stop to search for shells along the shoreline and to check a crab cage. 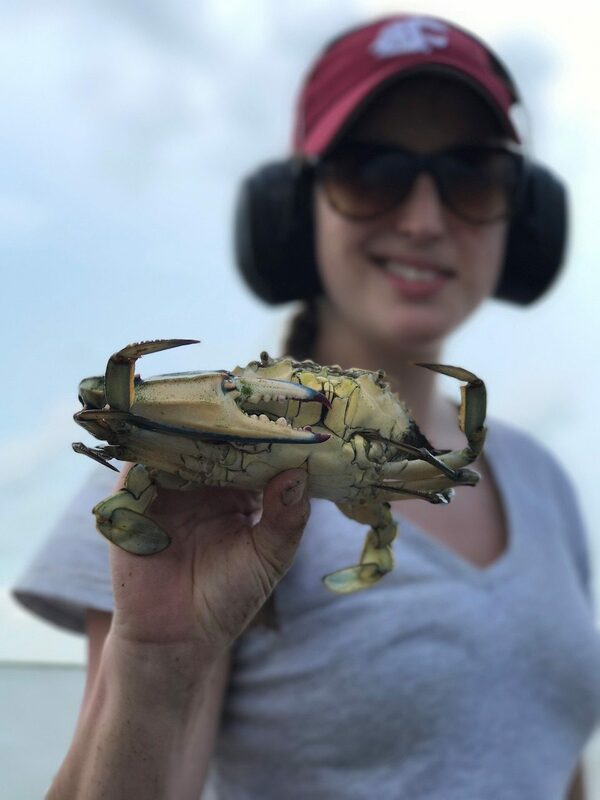 Learning a lesson from our soon-to-be veterinarian, aka Meliisa, if you turn a crab over, it will go to sleep (most of the time anyway). I’m not too interested in putting them to sleep, but that is a neat fact; I just prefer to eat them for dinner. Time flies, but we found time for a quick midnight trip to gig for flounder before leaving the Lone Star State. 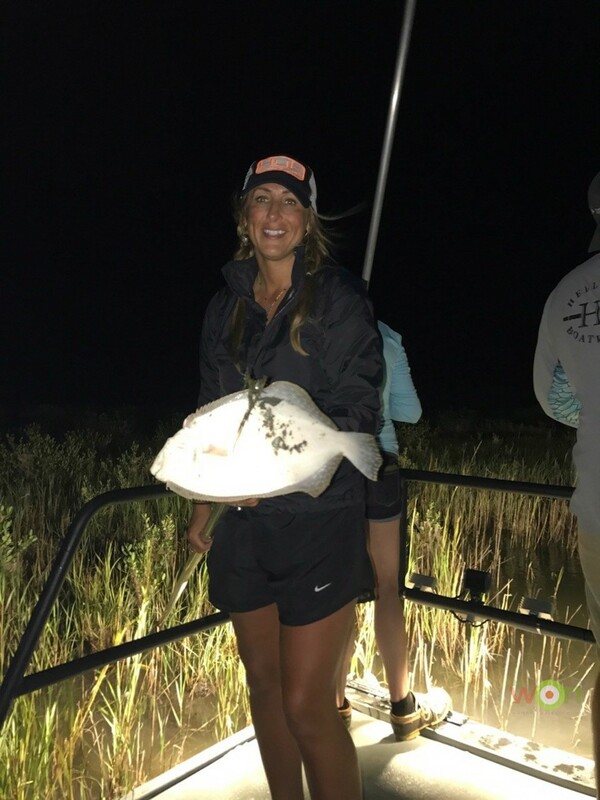 Flounder gigging, never heard of it before this trip, but it is now one of my favorite things to do. I am not perfect, I make plenty of mistakes but learn from them; however, I rarely regret anything until now. I loved flounder gigging, but I didn’t bring my Cambridge Tall Muck boots out this time. What was I thinking? I wanted to get off the boat and walk around; however, there were a ton of crabs and darkness prevailed except for the light around the boat. 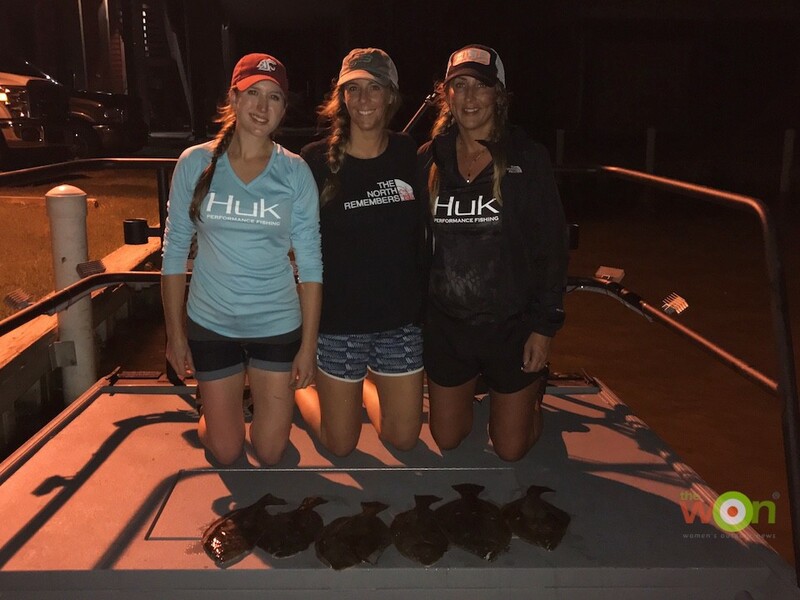 I didn’t feel like dealing with a crab pinching my toes, so I stayed on the boat but still managed to gig plenty of flounder. Note to self: always bring my Muck boots on every adventure! I am sad to say the adventure of the three Muck boot women with braids is over, but when one adventure ends … another begins. I hope to have the pleasure of hunting (and fishing and gigging) with my new friends again. I will spend the coming weeks preparing for my fall trips and without a doubt, my Muck Boots will be on the list of things to pack. Presently, I am eyeing a pair of the Arctic Hunter Tall Boots (MSRP $179.99) to add to my collection. 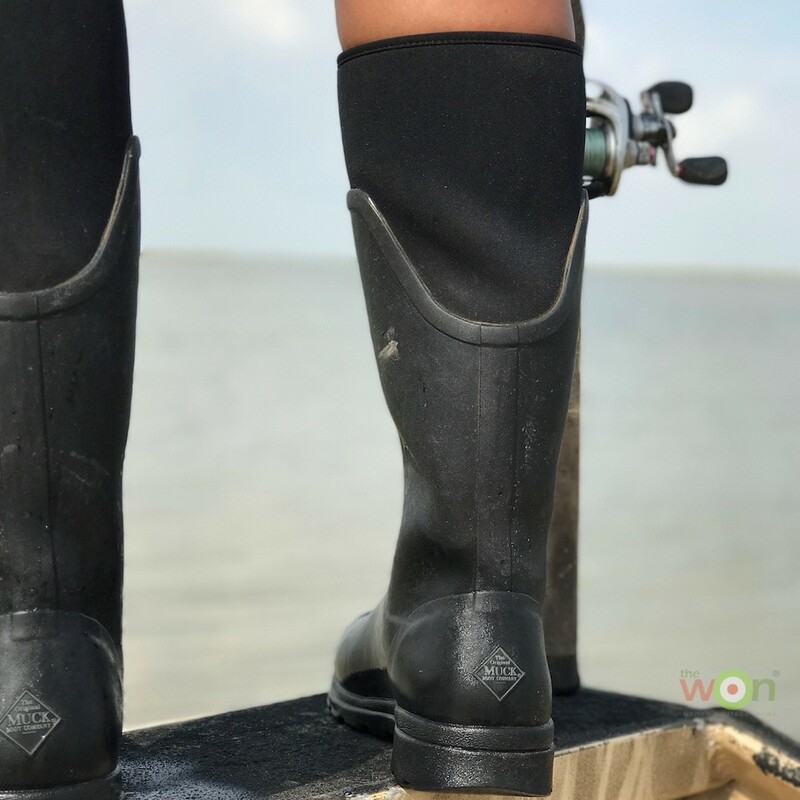 They would be perfect for my fall and winter hunts and I am confident that they will keep my feet warm and add comfort to my circumstances – whether I am sitting in a stand going afield.